Desktop Author helps you create e-books, business & marketing collateral and photo albums. The e-docs attempt to recreate the page turning experience one has when using a real book or paper document. The software helps you navigate through an e-book by simply clicking on the pages. Click on the right side and it goes forward, click on the left and it goes back. When I received this product I had a particular project in mind - production of an e-book several hundred pages in length; a kind of baptism by fire. Unfortunately this program is ill-suited to that kind of endeavor. I went back to the drawing board, read the manual and looked at the examples on the Dnaml web site and tried something less ambitious. I found that I could quite quickly and easily create a small book or presentation with this software. The tools in the product are quite simple to use even if they're not intuitive. I created a small, 8 page document and was quite pleased with the result. The product does what its supposed to although I did have to fight with it to achieve what I thought should be fairly straightforward results. The program does not have any real document or text import functions. You can only input text via the clipboard or through direct entry. The graphics handling and import, although simple to achieve, are also fraught with problems, mainly because of a lack of supported file formats. The inclusion of templates is a nice touch although I did find that the implementation of templates is problematic. You can't really apply a template globally in the form of a master page or document style and as a result this creates an additional and unnecessary workload. Because the Desktop Author user interface has no menus, I also had problems with figuring out how to close my book until I found out that right clicking on the book displays a context menu with an exit option. You can actually add a button with an exit function to the user interface. One really nice feature is that you can use the product to create documents in different languages. Arabic, Chinese, Hangul, Japanese and Thai are facilitated through Desktop Author's support for Unicode. The Eazyform tool is nice and allows for the "easy" creation of form based documents such as tests, feedback and subscription forms, contests and surveys. The function facilitates the e-mailing of results to the creator or client without any need for heavy programming knowledge of HTML or CGI. Import filters text - Word, HTML RTF and more. It would be nice if the import filter could also parse the imported docs and add pages to the e-book as needed. 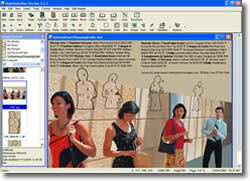 Desktop Author is very easy to use and does what it is designed to do very well. It is an excellent small document tool and can achieve much with the simple tools provided. If some of the missing features mentioned above are incorporated it will become a much more robust e-document creation tool. Even with some of the shortcomings mentioned above, I still rate this product very highly. One last item of note is that ACD Systems (makers of ADCSee) are now distributing this product as part of their Third Party Partnership strategy.